This article is a work in progress collection of personal notes on the subject of sharpening; I’m no digital image processing scientist so, even though I like to play with theoretical problems, I try to ﬁnd my answers within Photoshop (as I suppose they all do in Dan Margulis’ Color Theory Yahoo group, to which attention I ﬁrst would like to turn this one). Chances are that I won’t be rigorous too, my aim is to better understand the subject and share my ﬁndings with people who would like to integrate them, or simply give a feedback on the techniques exposed. If you’re not interested in all the (very trivial indeed) math and graphs, feel free to skip to the how-to sections: nevertheless, I hope everything will be food for thoughts. What I’m suggesting with this article is, among the rest, the possibility to target with appropriate sharpening different image features, even if they belongs to the same spatial frequency range (plus an experimental approach to high-radius low-amount sharpening). Then I’m showing how to use bilateral and mixed pyramid decompositions to modulate the sharpening within all the image frequencies. (Fig. 1.1) Before and after version, applying some of the tecniques exposed in this article. (Fig. 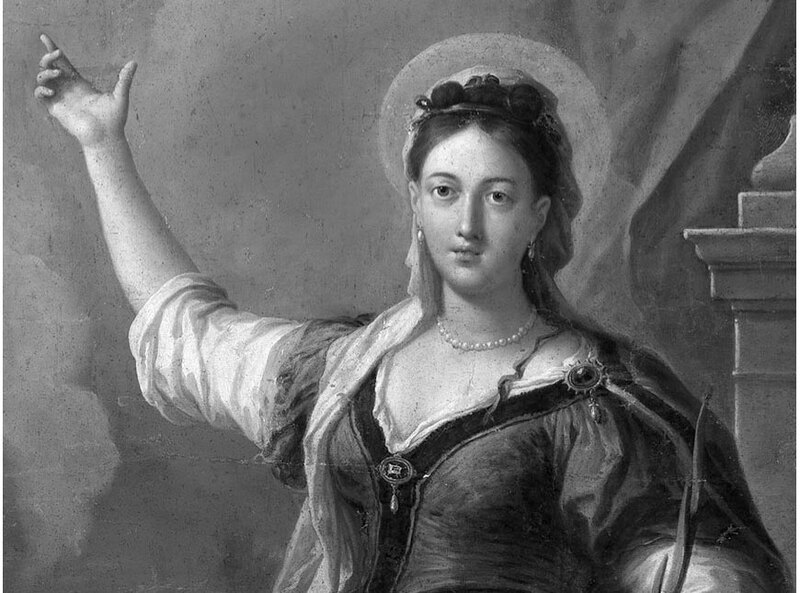 2.1) Original picture: BW version of the painting by Paolo de Matteis “Le sante Maria, Maddalena e Dorotea” (detail) National Gallery of Cosenza, Italy (Photography © Roberto Bigano). (Fig. 2.2) Original pictures, Blurred version and their subtraction. (Fig. 2.3) Original pictures plus the difference on Fig. 2.2 gives the sharpened picture. 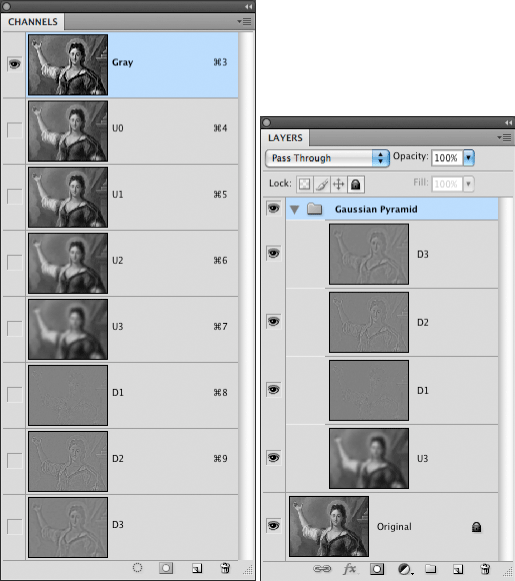 (Fig 2.4) Using a scaled version of the difference in Photoshop. (Fig 2.5) Detail of the sharpened version using a Gaussian Blur with Radius 4.0. (Fig 2.6) Intensity transition and Gaussian Sharpening. The key concept of Gaussian Sharpening is that the difference between original and blurred version is exactly what will be enhanced. If it’s used a blurring kernel (Gaussian Blur, GB, for instance) which softens edges and texture, then edges and texture will be more prominent when the difference layer will be applied to the original. 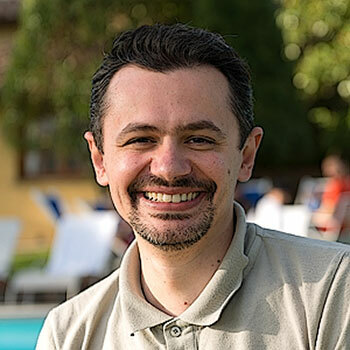 Depending on the algorithm used and the processing of the blurred picture, we may end with a sharpening that affects separately different image features. Pay attention that the first term of the subtraction is Source #2, and the second is Source #1 (little confusing, I know). The result you have is not scaled, and for it to be applied with the appropriate blending mode (Linear Light, LL from now on) there are two slightly different ways. Let’s baptize SS1 the Subtraction with Scale = 1 which implies a later LL blend 50% opacity, and SS2 the Subtraction with Scale = 2 which implies a later LL blend 100% opacity. Both ways are useful as we’ll see soon. Having tested a bit more the subject, I can now affirm that SS1 (LL 50%) and SS2 (LL 100%) are not exactly the same thing, so for the sake of precision, I’m suggesting you to use SS2 only. The issues in SS1 reveals in pyramid decomposition, i.e. blacks not really black (something you can easily test); nevertheless, if you’re not in the middle of a decomposition (an image one, of course 😉 you can pick either SS1 or SS2. (Fig 3.1) Intensity transition and Difference of Gaussians. 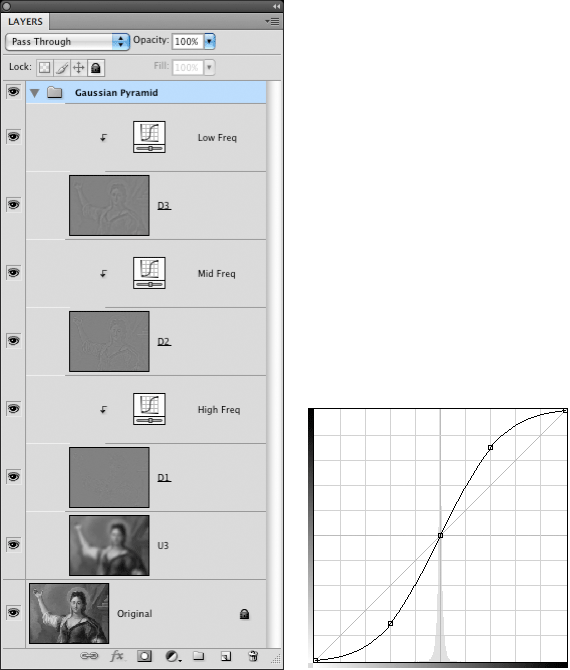 Fig 3.3) The original plus the difference equals the sharpened version: high frequency has not been affected by DoG (to have a gentler effect it could be suggested a lower opacity LL blend or an inverse S-shaped curve to reduce the contrast of the difference layer). (Fig 3.4) DoG with R1=4.0 and R2=20.0 and SS2, applied LL with an extra opacity lowering at 50%. I’m recalling here the DoG because it represent a ﬁrst step off the traditional sharpening track: I can report that it’s usually applied using a blur ratio ranging from 4:1 to 5:1, while a ratio of 1.6 mimics the Laplacian of Gaussian (LoG: an operator that calculates the second derivative of signal intensity, so it’s good for instance in ﬁnding edges. I plan to add more on LoG here later on). I still have to test it extensively: nevertheless an important feature that should be noted is its resemblance to HiRaLoAm (as Dan Margulis uses to call USM with High Radius Low Amount). But there’s a remarkable difference: namely, that edges are less or not sharpened at all, because they belong to the high frequency detail window that’s untouched by DoG (less or no difference between edges in GB1 and GB2, so less or no boosting at all).This could be a beneﬁt in workﬂows where different sharpening rounds are planned and an extra step is worth its time. Since it’s clear that subtraction and blurring are the core of this kind of sharpening, I started wondering what if other kernels are used instead of, or at the same time with, GB. (Fig 4.1) Subtraction using the edge-aware SB instead of GB. (Fig 4.2) Affecting less the edges, the texture is more enhanced. (Fig 4.3) The result using SB Radius = 6 and Threshold = 15. (Fig 4.4) SB with Threashold 15 and radii 6.0 – 50.0 – 100.0; SB fails at larger radii and detail appears again. A much better edge preserving ﬁlter is the Weighted Least Squares (WLS) operator. Unless you are an experienced programmer or you ﬁnd the way to put your hands on a computer with MatLab and Photoshop both installed, to use it is quite a problem.The results are remarkable indeed, check the links at the bottom of the page. This should give us all the instruments needed to modulate the sharpening in texture and edges separately, via subtraction layers/channels to be blended in LL mode. Let’s see. Following images are GB, SB versions and the scaled subtractions we’ve talked about. (Fig 5.1) Subtraction between SB (Radius=6 Threshold=15) and GB (Radius=4) to get an edge-only enhancement channel. (Fig 5.2) Edge-enhancing channel applied to the original LL 50% opacity. (Fig. 5.3) The result using SB (Radius = 6 and Threshold = 15) and GB (Radius = 4). What we should see is a Edges only sharpening. So we’ve been able to get a Texture and Edges sharpening (with GB), a Texture only sharpening (with SB) and an Edges only sharpening (using SB -GB). More pronounced effect can be obtained by higher opacity of the LL layers (when possible) or a sigmoid (aka S-shaped) curves adjustment layer clipped to it, whose opacity can be tweaked as well. In the ToDo list there are actions/scripts (and even a Photoshop CS4 panel) to automate the process. Until now we’ve tried to modulate the sharpening into the same, high frequency range (edges, texture). 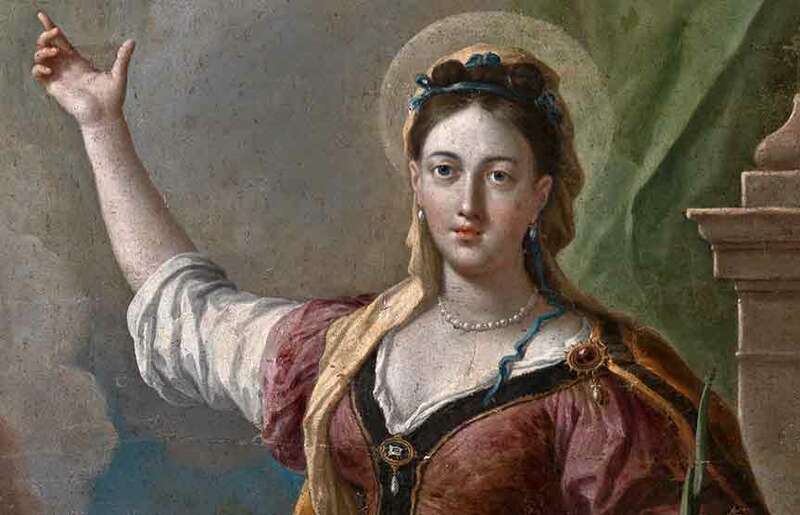 But an image usually contains several different frequencies: higher ones correspond to ﬁner detail (hair, for instance), lower ones to large, smoother tonal transitions (like the cheeks in a portrait). Now it’s time to try to target those different frequency ranges with appropriate, different sharpening. Pyramid decomposition is just… a way to decompose an image into several frequency ranges, and that makes easier to achieve our end. Let’s switch to Photoshop and try to build this pyramid. We only need to perform GB ﬁltering and subtractions, something we should be familiar with, by now. (Fig. 6.1) U1, U2 and U3, i.e. GBn(O). (Fig 6.2) D1 = U0 – U1. (Fig 6.3) D2 = U1 – U2. Fig 6.4) D3 = U2 – U3. 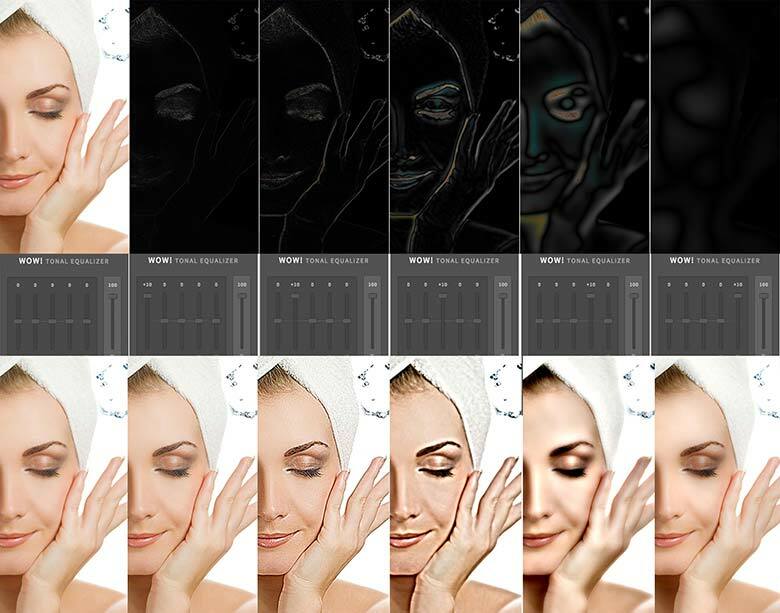 (Fig 6.5) Channels and Layers palettes after ﬁltering, subtractions and recomposing. Don’t feel afraid by the mess here, it’s possible to automate everything (ToDo list +1) and end up with a nice tidy Channels palette. Switching on and off the Set should make no difference – and hence the decomposition works: great! So what? 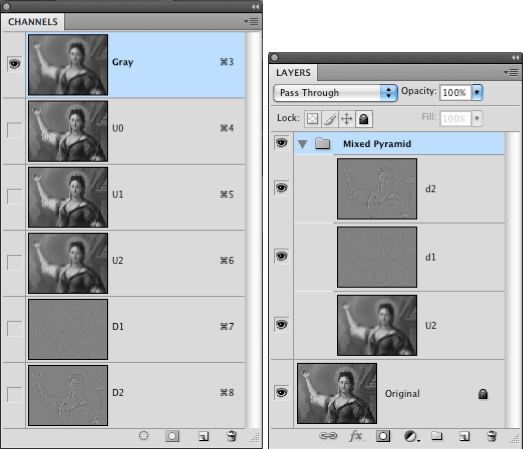 (Fig 7.1) The S-Shape curve common to all the three adjustment layers clipped to the Dn ones: their opacity control the sharpening in the High, Middle and Low Frequency range deﬁned by the GB radius (0.5, 2.0, 4.0 for those small thumbnails).The Layers palette in its ﬁnal conﬁguration. (Fig 7.2) One of the several possibilities obtained playing with frequency sharpening sliders. (Fig 8.2) Difference layers D1, D2, D3 (I used SS1 to make them more evident). (Fig 8.3) Result with Bilateral Pyramid decomposition for sharpening. Can you spot the difference between Bilateral (read: which uses SB) and Gaussian pyramid equalizers? Maybe not that much here, but if you’ll use one of your (high res, maybe high bit-depth) pictures, you’ll ﬁnd that being edge-aware, the Bilateral pyramid shows little or no halos, which is quite a remarkable feature in my opinion. Shadow/Highlights with SB (instead of GB) in its “engine” gives the same halo-free look by the way. As I’ve said before,WLS ﬁlter is a much better edge-aware smoothing operator, therefore it can be used for even better enhancements (have a look to the website of WLS’ creators for examples). Adobe, anyone listening? which comes from eq. 5.3. So, D1 is a frequency layer of a mixed decomposition which contains, and hence will be able to enhance,Texture alone; and D2 is a frequency layer of a mixed decomposition which contains, and hence will be able to enhance, Edges alone. (Fig 9.1) O – SB1(O) = D1, the texture only detail layer (SB Radius=3,Threshold=16). (Fig 9.2) SB1(O) – GB1(O) = D2, the edge only detail layer (GB Radius=2). (Fig 9.3) Channels and Layers palettes of a Mixed Pyramid. I’ve tried to collect here material coming from various sources and my own ﬁndings around the (very personal indeed) subject of sharpening. I was particularly interested in showing how to mix blurring kernels and why pyramid decomposition is a platform on the top of which many sharpening strategies can be developed successfully. Finding new ways to use old tools in order to accomplish even slightly sophisticated tasks pays for the time spent on the project. 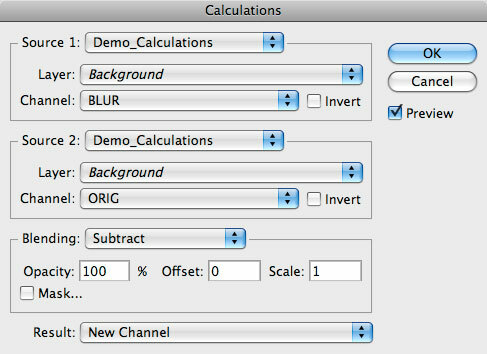 I still have many open questions, for instance how to simulate the USM’s threshold slider via channel blending (or masks, even though I’d prefer to do the masking with calculations). Nevertheless I’m pretty happy with the results by now: using those workﬂows means adding a lot of extra steps, even when I’ll ﬁnd the time to put together actions/scripts to automatize the monkey work; I don’t know whether someone but me would ever try to use them in production environments (it depends on the kind of production, by the way). But, again, it’s food for thoughts: I’ve always believed in knowledge sharing and plural researches, so I’m waiting for suggestions, corrections, and smarter workﬂows to sharpen. I plan to keep the article updated, so check for revision number at the top of the page – I have a big fat to-do list (actions, scripts, etc). Drop me an email if you like to be warned when something new appears or just want to give feedback. Read more about Frequency Separation with Wow! One of the best writing about the subject I’ve seen. It’s great you share such thing.